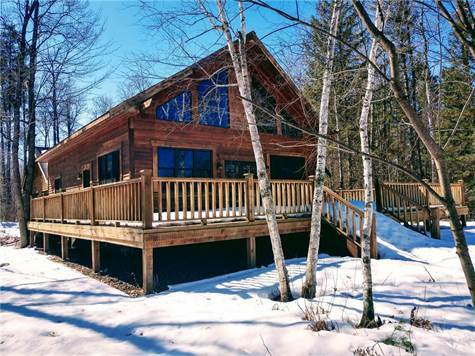 Step into this spacious cedar-sided chalet on the south shore of the Chippewa Flowage for a true Northwoods Lodge feel. Large master suite with private deck. Open concept main floor with floor-to-ceiling stone wall hosting the wood stove. Lower level with built-in stone bar and great open entertaining space. Large wrap-around deck and gentle elevation to the water. Original cabin on site would make a nice bunk house. Garage is 30x32 with loft space above. Wonderful property on a great body of water!